The former Massachusetts governor would have powerful allies in 2020. There’s just one problem: It’s not clear he wants to do it. Barack Obama is nudging him to run. His inner circle is actively encouraging it. Obama world’s clear and away 2020 favorite is sitting right here, on the 38th floor of the John Hancock Building, in a nicely decorated office at Bain Capital. 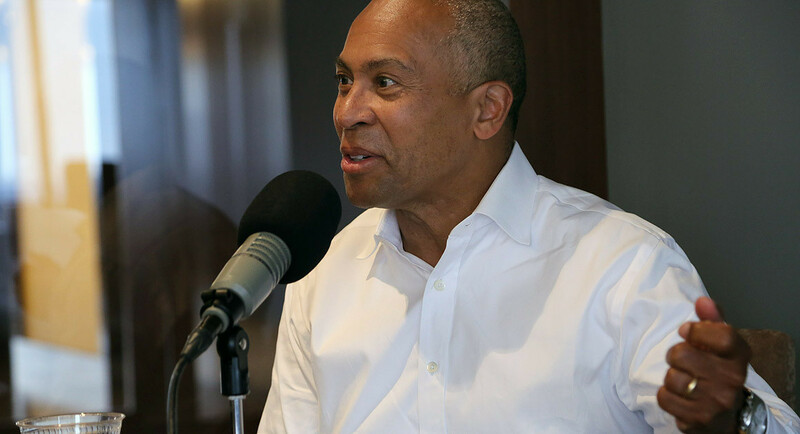 And Deval Patrick has many thoughts on what he says is Donald Trump’s governing by fear and a dishonest pitch for economic nostalgia, while encouraging a rise in casual racism and ditching any real commitment to civil rights. David Simas, Obama’s political director in the White House and now the CEO of his foundation, used to be Patrick’s deputy chief of staff and remains perhaps his biggest fan on the planet. Obama himself—who is personally close to Patrick, and counts him among the very small group of people whom he thinks has actual political talent—has privately encouraged him to think about it, among others. Obama veterans light up at the mention of Patrick's name. In self-assurance, style and politics, they see the former Massachusetts governor as a perfect match, the natural continuation of Obama’s legacy. “If you were to poll 100 notable Obama alumni, the only two people who would win that 2020 straw poll right now are [Joe] Biden and Patrick,” said one former senior White House aide. Among operatives, “the center of gravity would really shift in his direction in Obama world if he were to decide to run,” said another former top Obama White House official. The love for Biden, and hope that he might just go for it in 2020, remains strong among Obama types, and so far, with trips to New Hampshire and Florida and a new book coming out next month, the former vice president has done much more to stoke the talk than Patrick, who says he’s nowhere near printing yard signs. But he’s clearly upset with what Trump is doing, on both policy and approach. “The president, I believe, is at risk of diminishing the voice of the presidency because he pops off so often, and so, kind of, carelessly. I think there is a risk both domestically, and internationally for that matter, that we’ll begin to tune him out,” he said. He might be the only potential Democratic candidate who’s been played in a movie (last year’s Patriots Day, about the Boston Marathon bombing and its aftermath), but since finishing up as governor two years ago amid mixed reviews, Patrick has largely disappeared from politics. There was a brief rumble about how he might run for president himself, or might get considered to be Hillary Clinton’s running mate, but neither thought ever actually went anywhere. Instead, he’s been at Bain Capital, running a new social good private equity fund called Double Impact, which has raised $390 million for investments in small- and medium-size companies that he said need to show a focus on “sustainability, health and wellness, and then a place-based strategy we’re calling ‘community building,’ which is about companies that are intentional about creating good jobs and economic activity in places of chronic underemployment.” The first two investments are in a chain of small, low-cost gyms in Michigan and Indiana that he hopes will bring affordable fitness to underserved areas, and in a company in Texas that diverts organic waste. Click here to subscribe to the full podcast, including hearing Patrick discuss the presidential speculation, his relationship with Elizabeth Warren and the Bain deal he consulted with her on, police accountability in Chicago and his history suing Jeff Sessions. Not that any of this matters to Bernie Sanders-ized Democrats who are suspicious of finance types to begin with, and were taught by Obama’s 2012 brutal campaign attacks on Mitt Romney to think of Bain as a curse word—though notably, not by Patrick himself, who despite his friendship with Obama and co-chairmanship of the campaign, repeatedly refused to join in on the bashing. “When I joined the firm, I think it took two or three days to work out the terms, and 2½ weeks to figure out how to announce it,” Patrick said, acknowledging the awkwardness he was getting himself into. Among the people he talked to about it: Obama. He laughed when the podcast interview began with a question about Bain. But he answered without hesitating. Bain is a good company, he said. Romney, whom he barely knows, hasn’t been around for a long time. Plus, what he’s doing there is different. “We know how in public life, people and institutions get turned into cartoons,” Patrick said. Patrick and Obama met 20 years ago, when Patrick was in private practice. Put in touch through a Harvard Law Review connection, Obama called him for money for his state Senate run. Patrick, in a story he likes to tell, excitedly told Obama he’d write the biggest check he could. Obama started laughing. Illinois law had no limit, he told him. A friendship began. Obama asked Patrick’s advice about his 2004 Senate run. Patrick surprised Obama in Washington the next year to ask for advice about his own 2006 run for governor. Endorsements went back and forth. They and their wives got to know each other over dinners, a long night sitting on Jarrett’s back porch in Martha’s Vineyard in 2007, visits to the White House. Now, Patrick is the only politician on the Obama Foundation board. In May, Jarrett was at the SALT Conference, the hedge fund conference started by Anthony Scaramucci, the recently ousted White House communications director. Robert Wolf, the banker and Democratic megadonor who’s a frequent Obama golf partner, was interviewing her and Jeb Bush on stage, and told them ahead of time he’d ask their picks for the 2020 Democratic nominee. Bush picked Biden, who’d spoken there the night before. Jarrett, eager to stir the pot, picked Patrick. “Valerie’s always a little cautious with her words, so it was interesting to everyone in the audience that she said that,” Wolf noted. Trying to predict what will define the next presidential race at this point is like guessing the price of milk once corner stores open up on the moon. But if the 2020 question for Democrats is about taking on Trump’s management shortcomings or calling for a different way of merging government and business experience, Patrick would be able to check those boxes. If it’s about bringing the country together, he has a record of that, too, and an elevating, though not quite Obama-level capacity for inspirational rhetoric. If it’s about just veering the presidency back toward the old normal, as notable Trump opponents among Republicans and Democrats hopefully predict, Patrick’s calm demeanor could work there too. Or, as some joke, if Democrats are trying to make like they’re resetting the clock to before Trump won, having another African-American nominee might be it—in a way that most doubted could work had he run right after Obama in 2016. Somewhat ridiculously, Patrick likes to say he’s an amateur politician: He’s run for only one job, and after two terms as governor, stepped away. All through last year though, he infuriated the Clinton campaign by publicly saying she was struggling to give voters a reason to support her, and lacked any compelling campaign message. Pushing Democrats not to repeat that mistake is where he says his heart is now. As many shots as he takes at Trump, or Jeff Sessions, or anyone else, he resists being the resistance. For now, there is no actual motion toward Patrick 2020. No one in New Hampshire is getting calls. Axelrod said his own discussions with the former governor have remained very preliminary, still without answers to the key questions of whether he wants to subject himself to the insanity of a campaign or would truly want the job if he won. Operatives willing to play out the possibility get stuck on questions like fundraising, or the different approach to issues a black candidate would have to have if there are multiple black candidates in the field, or whether Patrick’s connection to Obama might come with some problems of its own. People close to Obama, meanwhile, stress that the former president first wants Democrats to focus on the party’s immediate structural issues and the 2017 and 2018 elections, and that Patrick isn’t the only person he’s encouraged to look at running, in the hopes of Democrats getting the strongest possible field. After Jarrett floated Patrick’s name in Las Vegas, he called her, asking her why she’d stirred up the speculation and gotten his phone ringing. She told him she was serious—she wanted to see it happen. Patrick’s own circle insists there’s nothing yet to see, but some are fantasizing about a 2020 run. He first ran for governor in the aftermath of the 2004 presidential campaign, feeling like it was his time to step up. People who know Patrick well say they feel like Trump’s election spoke to him in a powerful way. Most Patrick-watchers assumed he had passed on running for anything else, including exploring a 2012 Senate run, because his wife was eager for him to get back into the private sector and make some money. Axelrod, Walsh and others says this is wrong, and misreads Patrick’s own perspective. At the beginning of May, they arrived together at Boston’s John F. Kennedy Library for the Profiles in Courage Award ceremony that was Obama’s first big public speech of his post-presidency. On the red carpet headed in, local reporters asked the former governor about Obamacare repeal, and what he was hoping the president would say. Then they turned to Diane Patrick, standing a few steps back, and asked her if she was looking forward to seeing Michelle Obama. “I can’t wait. I can’t wait. I want to know how life is after the White House,” she said.